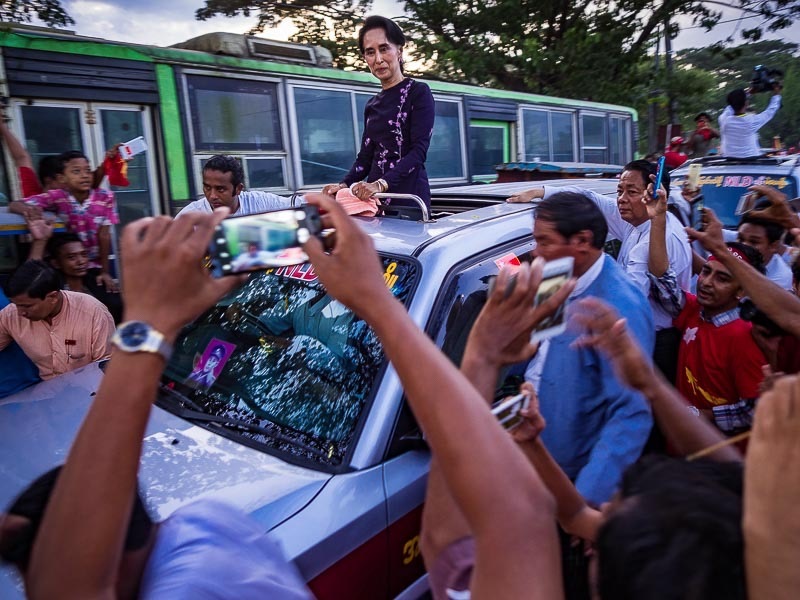 Aung San Suu Kyi leaves the final rally of her campaign hosted in a Yangon suburb. This is my favorite photo of Aung San Suu Kyi from the rally. 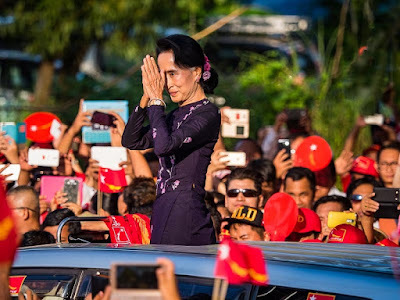 A lot of my photos from the Myanmar election were used in publications in Europe and the US. Most of them were used on web news sites but one was used by Newsweek in a double truck in their print edition. What's interesting, to me, is that this picture shouldn't exist at all. To me it's a good example of the lucky vs good argument (and this falls into the lucky category, not good). Normally I firmly believe that pictures are "made" not "taken." By that I mean that are a series of conscious decisions are made in the instant before the shutter button is pushed. Things like what lens to use, where to stand, choice of ISO, (sensitivity setting, used to be known as film speed), shutter speed, f-stop, whether to stand or crouch. All of those things are the decisions that go into making a photo. A photo that is "taken" on the other hand, is just that. Taken. 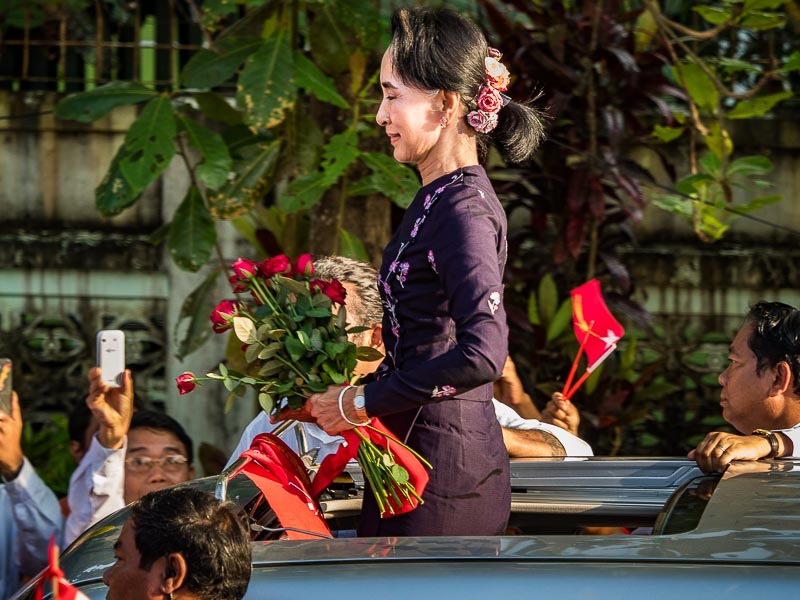 The photos of Aung San Suu Kyi leaving the rally were "taken" not "made." When I got to the final NLD rally of the campaign, I started by checking out the venue, looking for places I thought could make good pictures of Aung San Suu Kyi. I ruled out the area right in front of the stage because Aung San Suu Kyi would be standing about 10 feet above me, and while it would be fairly close, I would be photographing straight up her nostrils and that's not a good look on anyone. I looked at the two camera risers, one to the left of the stage and one to the right. The one to the left of the stage was closer to the microphones but the one to the right of the stage had a view of both the road she would drive in on and the stage. The one to the right offered more chances to get photos of her. 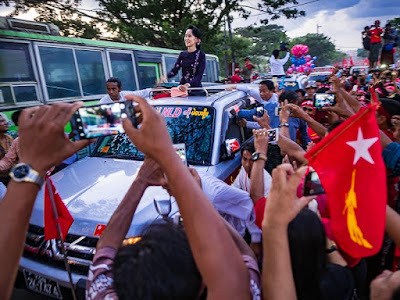 Burmese political candidates campaigned by standing in the open moon roof of their SUV's (see the above photo of Suu Kyi), so I chose the riser to the right of the stage. Then I positioned myself on the edge of the riser, so I could see both the road and the stage. My thought was that this was the only chance I would have to photograph "The Lady" and I wanted to maximize my chances of success. I don't use my zooms very often but I did use the 40-150 f2.8 Pro Zoom when I was photographing her. The 40-150mm gives me the reach of an 80-300 in full frame terms, attach the tiny 1.4X teleconverter and it's like using a 420mm telephoto. Once I had my location selected I put the 40-150 and 1.4X on my E-M5 Mark II and settled in to wait for the Lady. My plan worked pretty well. ASSK's motorcade passed the riser and I made a few frames of her. I was hoping she would face the crowd and wave, but she didn't and all I had was her in profile. I followed her through my viewfinder, and as she drove up to the stage, she bowed in greeting to the thousands of people waiting to see her. I made some photos of her on the stage, but there was nothing about them I liked. They were just photos of the candidate holding a microphone. I did like the above photo though, the one of her greeting the crowd. It's a little sterile, but the light was nice and the composition was clean. When the rally ended I walked back to my car and we headed out. We went about 10 feet and ran into a wall of people. The road was completely gridlocked with joyous Burmese people waving NLD flags, listening to Burmese rock and roll and chanting political slogans. We could not move so the driver turned off the car and I got out to work the crowd. I was only out of the car for a few minutes when the crowd erupted in loud cheers. Someone pushed me out of the road. I turned around and saw Aung San Suu Kyi's car coming towards me. I barely had time to react. I swung out the LCD viewfinder on my Olympus E-M5 Mark II, stuck the camera over my head (to try to get above the crowd) and pushed the shutter button. I refocused and made a second photo and then a third. The first picture almost worked. It's a little loose and she's looking the wrong way, but I like the way the NLD flag on the right leads into her and motorcade. Although she was looking in the right direction in the second photo, on reflection I don't particularly like the way the red NLD flag was cut off (these are all uncropped). Although I saw all three of these photos during the initial edit, I was working fast and made a mistake in the selection of the photos. Looking at them two weeks after the event, I much prefer the third one, it's a little tighter and without the NLD flag it's a little cleaner. This was right at the beginning of twilight and we were setting into the inky Burmese darkness. In Thailand or the US, there would be street lights on a street like this, but not in Myanmar, where there's barely a functioning electric grid. As it appeared in Newsweek. The exposure parameters are the same in all of the photos. ISO250, 1/40th of a second shutter speed at f2. I am a little surprised the pictures are as sharp as they are. If someone had said to me, "ASSK is coming this way, get ready for her," I would have set the ISO to 800 to get a shutter speed of about 1/125th to reduce the chance of motion blur. I look back on the photos from that day and I'm really happy to have these three frames. I'm also really lucky to have them.